Tired of having your metal patio furniture rust away try this aluminum bistro patio furniture set. The Warrens selection from Better Homes and Garden will fit this category. 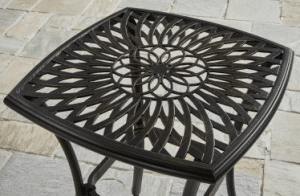 The aluminum frames and finishes that look like cast iron, will give you that timeless look for your patio or balcony. Having swivel chairs that has some back and forth movement will be a plus. The sling back and seat will be very comfortable, it is the same style of chairs as I have on my front porch for sitting and relaxing. In one box you will get a bistro set that will fit comfortably in any area that is at least 6 foot square. The swivel rocker chairs will give plenty of comfort for long term sitting. The sling seat and back will dry quickly and last very well in any outdoor conditions. I do store mine inside during the winter months. The table has a semi open top, the scroll design is very nice. The aluminum will never rust. The table is 22 inches wide and 27.5 inches tall. It has adjustable feet on each leg for leveling on uneven surfaces. The chairs are 28 inches deep, 24.5 inches wide and 37.5 inches tall. They will sit on the base with a post that is attached to a tension bar for the rocking motion. The sling seat and back is made of a PVC material that is very durable in outdoor conditions. You will not have to store cushions. This bistro set comes in one box that is 31 inches long, 25 inches wide and 34.25 inches tall. You will need to have a larger vehicle to pick this item up. Table will require the top to be turned over, four legs into corners and the square support to be attached. Tighten when standing on the legs and you can use the adjustable feet to do the final leveling. The seat and back of the chair will come in one piece. Attach rock bracket to the bottom of the seat base, then slide the swivel into the chair base. You should be ready for your favorite book or adult beverage in less than an hour, depend on your level of assembly skills. Mild soap and water is all that is needed to keep this set looking new. If you wish to keep looking shinny like new, it is suggested to use a clear liquid wax on the metal parts. I store my set indoors during the harsh winter months and rinse with a garden hose when it gets real dusty. I have a very similar set of chairs on my front porch. I have had this set for 5 years with little or no care. I think I have hosed off the dust on the frames several times. It is very comfortable for reading or just sitting with a glass of tea watching the world go by. 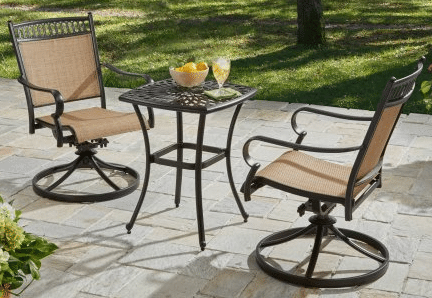 This Better Homes and Garden Warrens aluminum bistro patio furniture set from Walmart.com will be a great addition to any small outdoor space. Priced at under $250 with free shipping at the time of this article makes it a great purchase. I think I paid a lot more for just my two chairs five years ago. If you have any questions or comments, use the forms below. If you would like to see more information on any outdoor item, send me an email and I will get back to you. Great Review on the Warrens Patio Furniture. 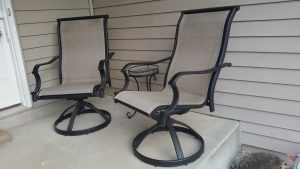 This three piece bistro set would actually look pretty good on my back porch, and I have been looking for a good deal. I like the fact that it is aluminum, and will not rust. Rust on a chair is not the most welcoming. It also dries quickly which is another handy feature. 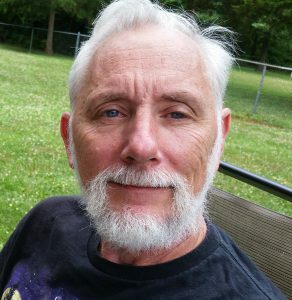 Thanks for your information, and I look forward to some of your future posts. I have similar chairs on my front porch. They are very comfortable and take very little time to clean. I sit and have coffee and watch all the neighbors go to work in the mornings. Makes a great set for a balcony also. I live in California where besides this last winter it rarely rains. The patio furniture at the store rusts in the rain. 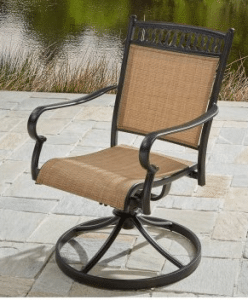 Does your patio furniture rust in the rain? I think the look my patio would increase greatly if I had some nice furniture that wasn’t all rusted up. If you live in a rainy or salty environment, I would suggest some aluminum or premium wood furniture for your outdoor space. Teak or eucalyptus wood is the best for this type of environment, it does cost a lot more than just regular patio furniture. Look for aluminum furniture for something that will last longer in rainy and salt environments. Some opt to go to a teak or eucalyptus wood furniture where the furniture rust quickly. Cheap wood furniture will cost 2 to 3 times the price of an aluminum or painted steel set. I am missing a few parts to the chairs but the set looks nice, really don’t want to send back, do you have a contact number to reach? I tried several times to email you with your address, it did not work. Use the following information to get the parts that you need.